Mobile health and fitness company HealthifyMe reaches new benchmark of quality on Google Play. 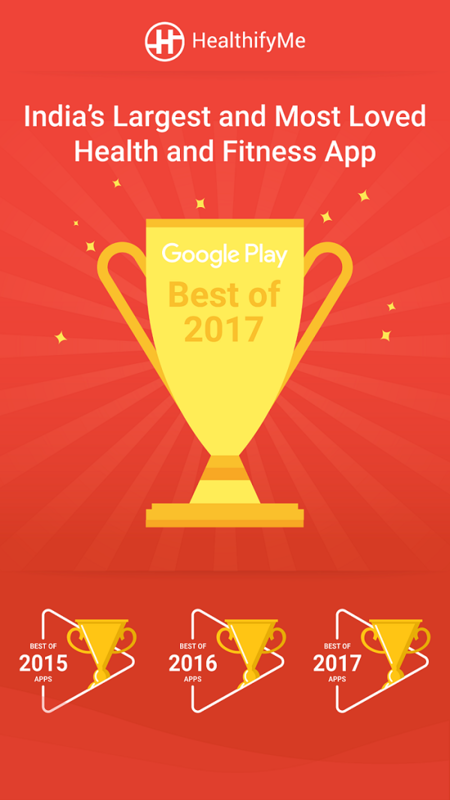 Recognized by Google in its annual round-up of apps, games, movies, books and more, HealthifyMe received the award for “Best Apps of 2017” under the ‘Best Daily Helper’ category, alongside Zomato and Paytm. Google continued its tradition of showcasing apps that held the highest standards of quality in design, user experience and overall popularity. 36 apps from over 3.3 million were handpicked by the Google Editorial Team. While renowned apps such as Facebook and WhatsApp didn’t make the cut, HealthifyMe is honoured to have received the award third year in a row. HealthifyMe boasts of the largest Indian calorie counter with personal on-the-cloud coaches available as part of premium plans. With a rating of 4.6/5 and over 3 million users, HealthifyMe is India’s largest and most loved Health & Fitness App. HealthifyMe recently received the renowned “Editor’s Choice Collection” award, making it one of the best Health & Fitness apps in the world. The launch of “Ria – world’s first-ever conversational Artificial Intelligence (AI)-enabled nutritionist” demonstrates the company’s emphasis on bringing the best of technology. This continued focus on being a product-first company caught Google’s attention in recognizing HealthifyMe time and again. HealthifyMe is a mobile health and fitness app that combines the power of technology with real human services to deliver measurable impact. Co-founded in 2012 by Tushar Vashisht and Sachin Shenoy, and incubated by Microsoft Accelerator, it is today India’s largest digital wellness platform catering to 3 million users with over 200 coaches. Its app is rated 4.6/5 and has been featured by Google and Apple multiple times for its quality benchmarks. The company delivers measurable results on eating habits, fitness, and weight and is a platform of choice by leading Corporates and Healthcare partners in India. With over 300 employees, it has a physical presence in Bangalore, Delhi, Mumbai and Chennai.